It’s all the essentials of PHP and MySQL web development, from beginner questions all the way to higher level learning. Written with sophisticated examples, it’s goal is to get you going with a great website, fully customized and behaving like it should, no matter what you’re trying to do. More so than other books, Head First takes a much more relaxed and colloquial tone that some readers might find it a little condescending, but by and large it makes the learning experience far more enjoyable and a bit less dry. One downside to Head First PHP and MySQL is that it does require an extensive understanding of HTML and CSS, without which most readers will quickly be lost in the woods. 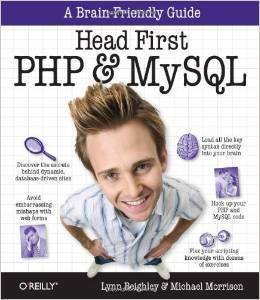 All in all, Head First PHP and MySQL, even though it’s a little dated, is a solid PHP resource for intermediate developers looking to expand their knowledge and come to grips with some of the more complicated ins and outs of server-side programming.